It goes without saying that the Joint Opposition (JO) somewhat spoiled the local government election victory of its official political party, the Sri Lanka Podujana Peramuna (SLPP) with its no-confidence motion against Prime Minister Ranil Wickremesinghe. However, the subsequent events unfolding within the ruling coalition point that the motion was not totally defeated. The morale boost that was gained by the SLPP after it came first in 232 out of 340 local councils at the February 10 elections was such that their demand for the so-called Yahapalana [National Unity Government] to resign forthwith was seen by many as legitimate. Later they demanded that the PM step down from the post. However, with the defeat of the no-faith motion they seem to have rescinded those demands. It was President Maithripala Sirisena who first demanded the resignation of his coalition partner Premier Wickremesinghe in the wake of the local council polls, despite his party, the Sri Lanka Freedom Party (SLFP) having suffered even more at the same elections. He even reportedly sought the opinion of the Attorney General on his powers for the dismissal of the Prime Minister. Yet, he too seem to have meekly submitted to the new situation after the defeat of the no-faith motion. The Joint Opposition should have expected this outcome of their no-confidence motion in the light of the ground situation. There were no considerable dissension within the Prime Minister’s party, the United National Party (UNP) which had 106 members in the Parliament when the motion was handed over to the Speaker of the Parliament, except for a few Parliamentarians challenging the party leadership. State Minister Palitha Range Bandara had challenged his party leader, Wickremesinghe with a warning to bring in a no-confidence motion even before the Joint Opposition announced its decision to bring in one. Deputy Minister Palitha Thewarapperuma had resigned from his post. Ven. Athureliye Rathana Thera who contested under the UNP symbol had distanced himself from the party while Deputy Minister Wasantha Senanayake was also grumbling against the leadership. 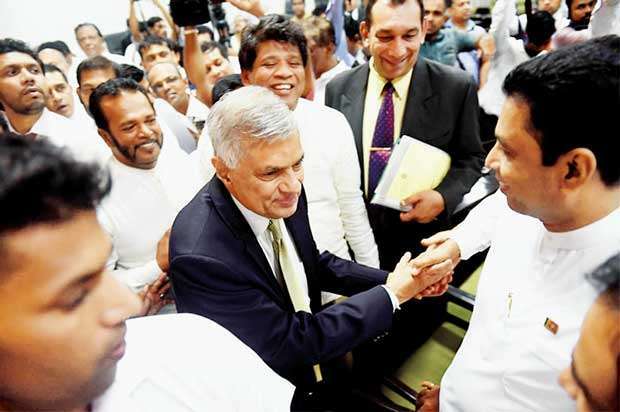 That means there have not been any major splits or dissensions within the UNP except for the frustration among these few individuals when the Joint Opposition attempted to oust the Premier. With the Tamil National Alliance which had 16 members in the House seeming to come forward to defend the Prime Minister it was an obvious fact that the Joint Opposition’s no-faith motion was doomed to fail, even if all parliamentarians of the SLFP had joined hands with them. There wouldn’t have such a morale setback for the Mahinda Rajapaksa loyalists in the Parliament as well as at the grass root level, hadn’t the Joint Opposition created an unrealistic frenzy among the masses over the success of the motion. They should have used the motion only to strengthen the public opinion against the government. The local government election victory had created an unusual haste among the Joint Opposition and the SLPP to come back to power and hence they demanded the government’s resignation. With President Sirisena who had been openly criticizing the UNP over the Central Bank bond fraud during the election campaign calling for the resignation of the PM after the election, they were encouraged and their demand also took a twist to hunt down the Premier. Nevertheless, the effort by the joint Opposition to prove that the PM does not command the confidence of the Parliament ended in a flop, demoralizing its rank and file. And now the UNP has started to hit back. The party is now hell bent to take the 15 SLFP ministers and Deputy Speaker of the Parliament Thilanga Sumathipala to task. While calling them to resign their posts the backbenchers of the party had submitted no-confidence motions against six of them. However, Premier Wickremesinghe had advised them to withdraw the motions on the grounds that they were not approved by the Party. Yet, it is doubtful whether the backbenchers would resort to such a move without the party leadership giving its nod. Despite their being a moral issue with respect to the SLFP ministers who have to work with the UNP as a team if they are continue to be a part of the government, the demand by the UNP for the Deputy Speaker to step down from the post seems to be illogical and against the tradition. Unlike the Speaker who does not take part in debates or voting in the Parliament, the Deputy Speaker and the Deputy Chairman of Committees who chair the House in the absence of the Speaker take part in debates and voting, unless they are at the Chair. This is not against the law or the tradition. Hence, the Deputy Speaker or the Deputy Chairman of Committees would not be disqualified to hold their respective posts on the grounds that they had taken a side during a particular matter debated in the House. Even the Speaker is allowed to use his vote in case of both parties getting an equal number of votes on a particular matter. However, can a Cabinet minister continue as a member of the Cabinet without the consent of the PM when the Constitution stipulates “the President shall, on the advice of the Prime Minister, appoint from among Members of Parliament, Ministers, to be in charge of the Ministries so determined? Whatever the legal provisions on the removal of the ministers are, if the 16 SLFP MPs who voted in favour of the no confidence motion are relieved of their portfolios it would be a shot in the arm of former President Mahinda Rajapaksa, at the expense of President Sirisena. Those 16 MPs might soon join hands with Rajapaksa as they would not stay any longer without the luxuries of portfolios, on a possible losing side. Rajapaksa too had invited them to team up with him while some of them might have been longing to cross over after the dismal performance by the two ruling parties at the LG polls. If they join the Rajapaksa camp as a group it would offset the setback suffered by the Joint Opposition after the defeat of the no-confidence motion. Their possible exit from the government would make the UNP more dependent on the TNA, giving an added advantage to Rajapaksa camp to exploit the Sinhalese vote bank at the future elections. Therefore, notwithstanding the Joint Opposition’s immediate setback in the no-faith motion issue, the motion has yielded to the group by way of dividing the two ruling parties as well as the SLFP.